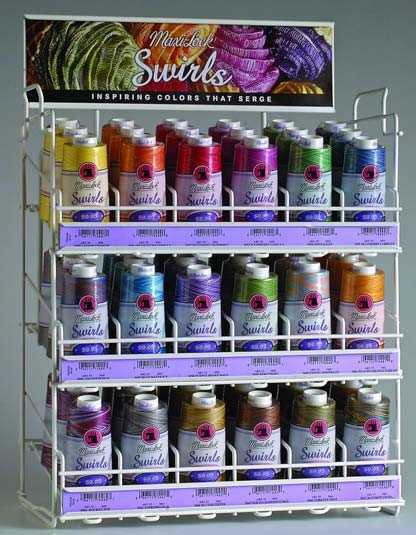 Swirls, the newest inspiration in Maxi-Locks world of color, look great in a multitude of serging applications from home decorating to gifts, embellishments to quilting. Wherever your creative inclinations take you, Swirls will add flavor to your finishing and decorating ideas. Available in 18 colors, 3,000 yard cones. 100% spun polyester threads coordinate beautifully with Maxi-Lock solids. Maxi-Lock meets the demands of serger sewing like no other thread, withstanding the high speeds and tensions that are unique to serging. That�s why Maxi-Lock is the best-selling serger thread!